Fireman Herbert Arthur White passed away on 25 January 1970 aged 86. Herbert was born in Penge, south-east London, on 19 February 1883. Research of his younger life in the capital has proved fruitless and the first record of him was discovered in the 1901 Census when, aged 18, he was an Ordinary Seaman of a Royal Navy unit at Port Valletta, Malta. His service records show unbroken service from February 1901, when he originally signed up for twelve years, until he stepped off HMS Pembroke on 18 February 1923 as Petty Officer. He moved to the Isle of Wight in 1928 and the County Press that reported his death in 1970 stated that at differing times he had served in firefighting roles in Yarmouth, Cowes and latterly at Ventnor. For a time he worked for the Shore Signal Service, in the salerooms of a local auctioneers and as a canoe lake attendant. Although researching his life and service in the brigade has been without success, a particular part of his life is well known and was well reported at the time. His Naval records show a posting during the First World War to Eastern Blyth Haven on the coast of Northumberland. While there he was involved in a notable tragedy at sea. Headline from an article in the Newcastle Daily Journal of 11 December 1915. 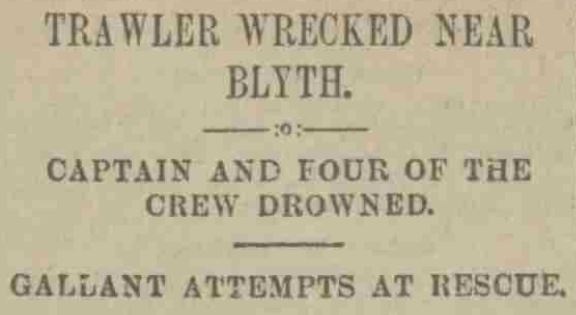 The Newcastle Daily Journal of 11 December 1915 began a report under the headline (above) that read; The North Shields steam trawler Naval Prince was wrecked on the Seaton Sea Rocks, Blyth, yesterday morning, and five members of the crew were drowned. The vessel, which had left North Shields for the fishing grounds, and had completed its work by Thursday, was making for the Tyne very early yesterday morning when a south-easterly gale broke. The Naval Prince ran onto the Seaton rocks, and attempts at rescue by the Cambois and Blyth lifeboats were faced with tremendous difficulties owing to the heavy seas and the inky darkness. The fact that four of the nine men were saved was due to typical Northumbrian gallantry. The heroic conduct of a Blyth coastguard was revealed at an inquest held today touching the death of one of the five victims of the North Shields trawler Naval Prince, which was wrecked at North Blyth on Friday. One of the earliest witnesses called was Francis Hill Cook, chief engineer of the trawler, who described how the tragedy transpired; We were running for home and went ashore on the rocks at North Blyth. Yes it was bad weather and was getting worse as the tide rose. But it was quite clear, five of the men were in the wheelhouse, they were the skipper, the mate, a fireman, a cook and the second engineer. Four of us were in the rigging, about an hour after we struck the rocks. He (the victim) was caught by a big sea, washed overboard and drowned. Coastguard Herbert White was called to give his testimony; I was summoned to the attend the wreck and arrived there about two o'clock of the morning. At first the trawler was a good distance from the shore, but as the tide rose she was driven further in. We endeavoured to get communication by means of a rocket apparatus, and five lines were shot, but all to no avail. I suggested that the only means possible would be for someone to swim to the trawler with a line. I volunteered to go myself but the chief wouldn't allow me to go. At the time I was on top of the sea wall and suddenly I saw one of the men, Bushby, fall from the rigging into the sea. I could see that it would be utterly impossible for the man to get ashore without assistance. I ran along the wall for a distance of about 400 yards, and then entered the sea. I had great difficulty keeping my feet, I was still wearing the gaiters and boots. I then commenced to swim out to the assistance of the man. The Coroner began questioning White; You swam out, did you? Yes, I couldn't wait. Replied White. It was impossible. How far was he from the shore? asked the Coroner. About 200 yards. Answered White. The Coroner asserted; I suppose you did not succeed in saving him? Yes I got him ashore all right. I could see he was drifting towards Cambois, and I shouted to him to follow me. I next caught hold of him, and dragged him towards a rocket line which had become entangled with the rocks. I got him as far as the boat, and then was helped out by Coastguard Newman and a Mr Pringle. Seeing as I was by then wet through I volunteered to swim back to the trawler with a line but was ordered not to do so. The Coroner; At all events you were quite ready to risk your life again to save the others? In summarising the Coroner, Mr H.T. Rutherford included; I am glad indeed that I had called Coastguard White. It is just as well that the jury should be aware of the facts as to what happened on shore after the vessel struck the rocks and I think that White cannot be too highly commended for his conduct on this occasion. He risked his life in swimming out in a very heavy sea, with the result that he saved one of the crew. It was indeed a brave and heroic act and I am strongly of the opinion that the matter should be made known to the proper quarters. Not only did he save the man but volunteered to swim out again to the rescue of the others, although he was not allowed to do so by his superior officer. I repeat that such gallant conduct is highly commendable. 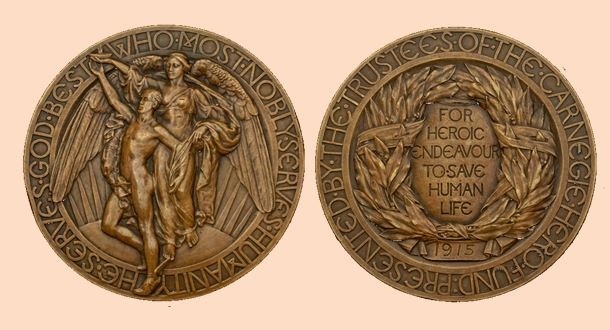 The appropriate authorities were advised of Herbert's selfless gallantry during the wreck of the ST Naval Prince and subsequently he was awarded the Carnegie Trust Fund medal for heroism in addition to the Sea Gallantry Medal, officially known at the time as the Board of Trade Medal for Saving Life at Sea. Herbert would have been entitled to use the post-nominals S.G.M. It's a shame that not more of this remarkable man's life can be unearthed, suffice to say Herbert was a courageous individual and would no doubt have remained so in firefighting as he was at sea. We know that he served as a fireman at three different Island locations, but whether for the pre-WW2 brigades, during the war in the National Fire Service, or after it in the County brigade remains lacking in evidence. He passed away at home, India Cottage, Grove Road, Ventnor on 25 January 1970 leaving a widow (after forty years marriage) and one son who was also serving in the Royal Navy at the time of his death. After cremation arrangements were made for his ashes to be scattered in the sea off Ventnor. Rest in peace Fireman White.